The existing Regional Water Management Group (RWMG) for the Yosemite-Mariposa County region has the diversity and representation required to successfully and collaboratively manage its water to enhance the supply and quality of water for the state of California. Participants in the Yosemite-Mariposa County IRWM planning effort have emphasized their commitment to an inclusive, functional, forward-thinking foundation. Members know that by building upon strong collaborative cross-jurisdictional relationships, a successful planning effort and implementation of future projects is more assured. Watershed management involves more than simply assembling stakeholders and involving the public. It requires building a committed, community-based management team capable of sustaining the planning process as well as supporting important economic, social and resource-based relationships. To learn more about the Yosemite-Mariposa IRWM group, please call the regional (see below), and view their IRWM Plan here! The Y-M Region is an area with large forested areas, including 53% of the Region which is managed as federal lands by Yosemite National Park, the Bureau of Land Management, and the Sierra and Stanislaus National Forests. Although the Region does not have a large population, the Merced River watershed, which is about 64% of the Region, is a major tributary to the San Joaquin River, which combines with other Delta tributaries to provide water for millions of people in the San Joaquin Valley and Bay Area, and water for irrigating hundreds of thousands of acres of prime farmland. The Region is located on the Western slope of the Sierra Nevada Mountain range entirely in Mariposa County, California bordering the Central Valley as shown on Figure 1-1. The Region has a varied terrain from rolling foothills in the western portion of the Region to rugged mountainous terrain in the east with a land area of about 1,461 square miles (935,228 acres). The Region encompasses much of the high Sierra headwaters of the Merced River which are in Yosemite National Park as well as the foothill watersheds of the lower Mariposa County and the Fresno-Chowchilla River many of which are in the Stanislaus or Sierra National Forests. Terrain varies throughout the Region from granite peaks exceeding 11,000 feet in the east to grasslands below 1,000 feet at the western border of the Region. Variation throughout the middle of the Region includes conifer forests, glacially carved valleys, mountain meadows, and oak woodlands. The Yosemite-Mariposa Region is sparsely populated, with approximately half the 18,000 residents living in small communities dotting the western portion of the Region. The remainder of the population resides in rural settings. There are no incorporated cities in Mariposa County although the larger communities include the Town of Mariposa, Yosemite Village, and Lake Don Pedro. Native American Tribes are also important to the region’s history and present day culture. During late pre-contact and early contact times, the Southern Sierra Miwok inhabited the lower banks of the Merced River and the Chowchilla River, as well as Mariposa Creek with an inhabited range from the Sierra Crest, the divide between the Tuolumne and Merced Rivers, the Fresno River and along the base of the Sierra foothills. They also actively travelled across the Sierra crest. 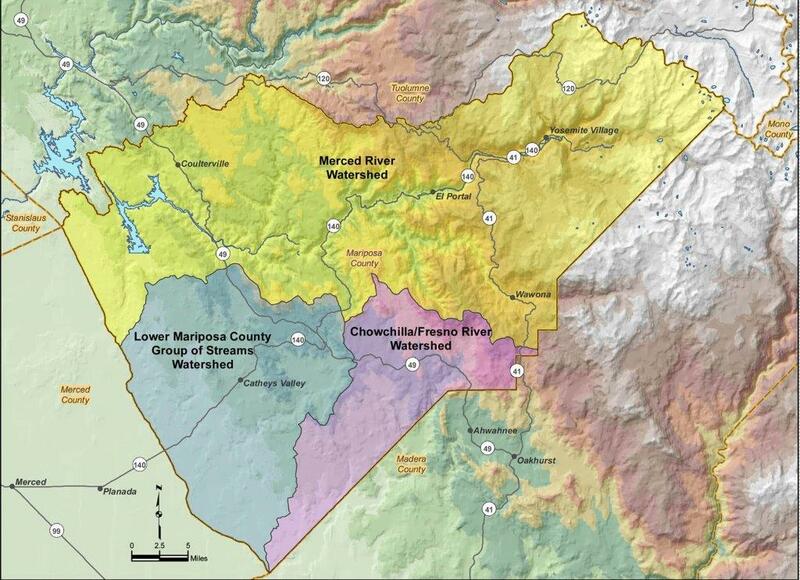 The water resources of the Yosemite-Mariposa Region have been developed to make use of the abundant water resources in the upper watersheds for agricultural, municipal, and other uses in the Central Valley. West of the Y-M Region, the Merced River and Mariposa Creek eventually flow into the Lower San Joaquin River, a tributary to the Sacramento-San Joaquin Bay-Delta estuary. The Merced River begins high in the Sierra Nevada and provides a reliable, year round water source through rain, snow melt and melting glaciers. Despite the vast surface water originating in the region, groundwater resources make up the majority of the Region’s local water supplies. The majority of the Region’s groundwater supplies originate from hard rock wells in the plutonic granites of the Sierra Nevada. 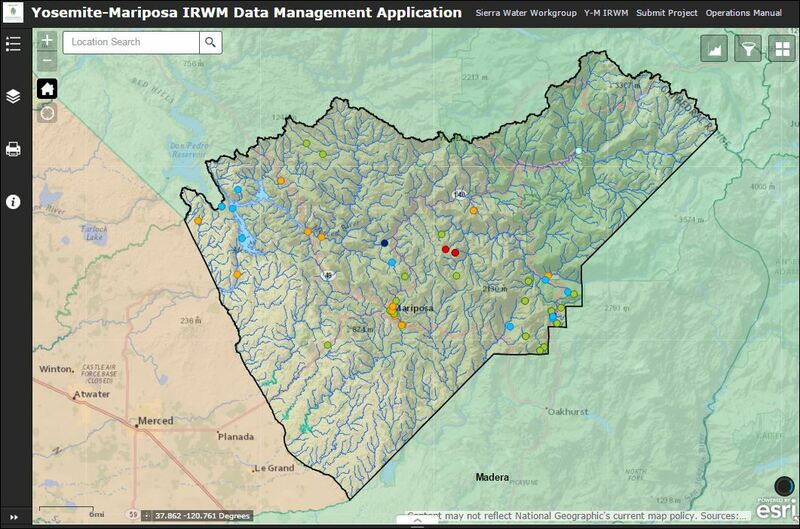 March 1st, 2016: The Sierra Water Workgroup is pleased to announce the formal launching of the Yosemite-Mariposa IRWM Data Management Application! This web tool has been in development for several months and is a web tool designed for IRWM stakeholder regional and interregional project management, resource streamlining, and an improved collaborative ability. The Application allows Yosemite-Mariposa stakeholders to access and print countless data tables, maps, and charts, as well as submit new IRWM projects; a hub for all IRWM project stakeholder needs. Please see our operations manual for more detail! Please review the Yosemite-Mariposa IRWM Data Management Application here or by clicking on the image below.